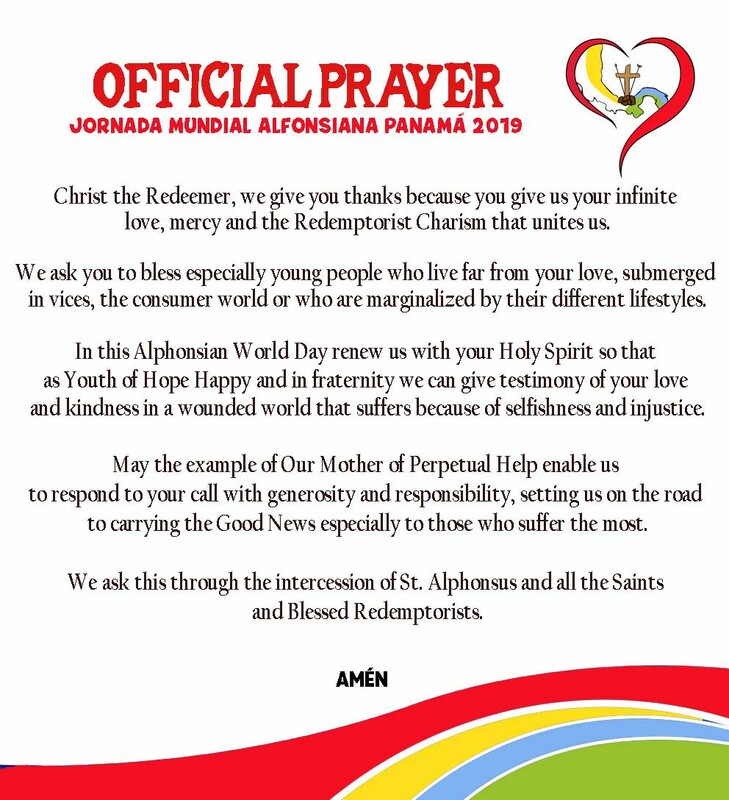 The Preparatory Commission of Panama WAD (World Alphonsian Youth Day) 2019 wishes to communicate the information on the enrolment of the Redemptorists, on the Hymn, on the Logo, and on the official Prayer. Registration WYD and WAD C.Ss.R. * The Registration of the WYD: This will be carried out in the Provinces. There is already a Macro-group, in which all the pilgrims of the congregation must register. To start with the registrations, each province must choose a manager or group leader, who must send a full name and an e-mail. Your email will receive an access link through which you will be able to access a sub-group within the macro-group. As a next step, you must fill in the information fields that are required and then pay. We know that some parishes have not yet organized themselves and it is urgent that they can define their own groups/leaders and proceed with registration. Within the registration of the pilgrims, the priests have a special registration because they will receive an accreditation. Finally, payment must be made by credit card or bank transfer. There is a solidarity fund: it is destined for the Dicastery for lay people, families who live in countries that are experiencing economic crises, wars, religious persecutions, etc., and which will be analyzed by the Dicastery. The local organizing committee of WYD and the Dicastery for laity, family, and life motivate all groups to contribute. But payment is not mandatory. * The work of the macro-group is to organize and control the Redemptorists who come to WYD, ensuring that their stay is close to the parish of San Gerardo María Mayela, home of the WAD (JMA). Soon a page will open for the WAD where they will register. For more information, contact: Ahiezer Domínguez: urobi_1096@hotmail.com, +507 6433-0148. Adelyn García: aitga@hotmail.com, +507 6949-8805. Júlio Cesar: juliocesartors@gmail.com, +507 6857-4394 Daniel Combe: danielcombe32@gmail.com, +507 6005-3871. Edgar Saul Ávila: edsaul_avila@yahoo.com, +507 6987-2696.
www.sangerardomariamayela.com where all the information on WAD can be found. Note: the official date of registration for the Panama WAD 2019 will be notified. The WAD will have no additional costs. We invite you to follow the official WAD social networks to follow official information. You can find us on Twitter, Instagram, and Facebook as @ jma2019oficial.